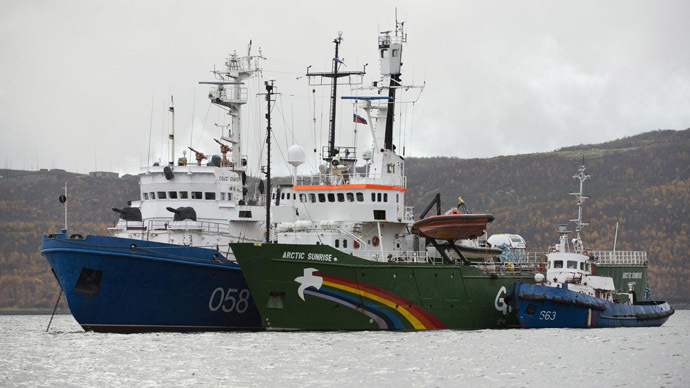 A Russian court has formally charged 17 of the 30 Greenpeace activists with piracy. They were arrested in Russia after staging a protest at an Arctic oil rig. The charges that Greenpeace calls “extreme” carry a maximum penalty of up to 15 years in jail. "It is an extreme and disproportionate charge," Greenpeace International executive director Kumi Naidoo said. "A charge of piracy is being laid against men and women whose only crime is to be possessed of a conscience. This is an outrage and represents nothing less than an assault on the very principle of peaceful protest," Naidoo said. The proceedings in a court in the northern city of Murmansk were adjourned on Wednesday evening, but will continue on Thursday. “We believe the charges absolutely unfounded and illegal. Our activists had no motive for taking possession of anyone’s property. There was no crime,” Greenpeace lawyer Mikhail Kreindlin told Interfax. 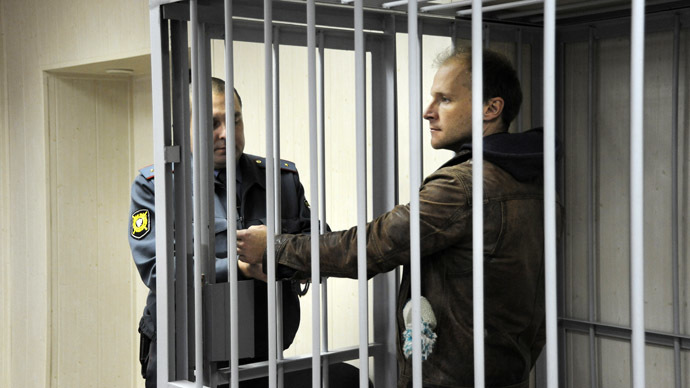 The prosecution insists Greenpeace activists “posed a real threat” to the personal security of staff and property at the Prirazlomnaya platform and “peaceful” goals do not serve to justify the activists’ actions. 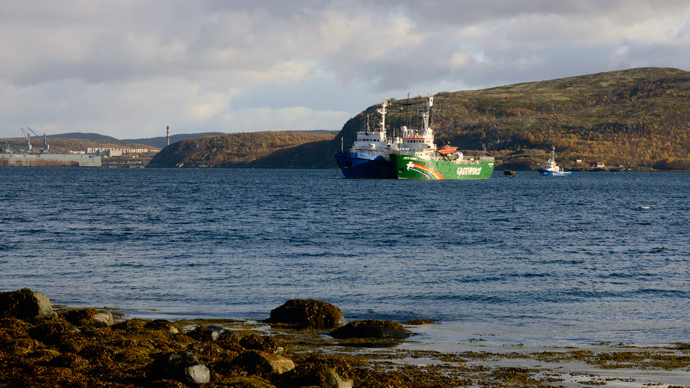 A Greenpeace vessel arrived at the oil rig in September in order to board it and stage a protest against Arctic drilling. The ship and 30 people onboard were detained a day later by Russian border guards. The activists, who come from 19 different nations, were arrested and remanded by a court in the city of Murmansk until November 24. The dubiousness of the allegations was voiced by Russian President Vladimir Putin, who said he didn’t believe that the activists were pirates. But he said they violated international law and could have provoked a serious environmental disaster with their actions. Meanwhile, rights activists say The Arctic Sunrise jailed crew members are "close to shock" over their “very inhumane” conditions. Greenpeace has published a letter the Dutch campaigner, Faiza Oulahsen, wrote from her cell, which recounts her experiences in detail - from initially boarding the Greenpeace icebreaker up until a few days ago. The activist says they are being transported to the FSB office like animals - in buses, that are like dark, locked up metal cages. Other activists also complain of cold cells, a lack of suitable clothing and food. The detainees are struggling to make themselves understood since virtually none of the prison staff speaks English, the head of a state-connected regional prisoners' rights watchdog, Irina Paikacheva was cited as saying by AFP. "I have no idea how this is going to end, or how long it's going to take. The uncertainty drives me crazy," Faiza wrote. At the same time, prosecutors have checked one of the pre-trial detention facilities, where 18 activists are being held, and concluded that there are no violations and that no complains about food and cells have been made. Greenpeace also confirmed earlier that crew members did not complain about conditions. Meanwhile, Greenpeace supporters rally around the world to protest against Shell and Gazprom’s planned oil drilling in the Arctic and the detention of activists in Russia. On Wednesday, Greenpeace activists chained themselves to pumps at five gas stations in Berlin. Prior to that on Tuesday, Greenpeace protesters interrupted the Champions League match against Schalke as they unfurled a banner protesting against Gazprom, sponsor of both the League and the Bundesliga club. Play in the Swiss city of Basel was halted for around five minutes after four protesters wearing orange boiler suits and helmets descended slowly on ropes. The banners read: "Gazprom, don't foul the Arctic" and "Free the Arctic 30". The protesters then hauled themselves back on to the roof. The Prirazlomnaya oil rig, which Greenpeace targeted in September, was placed on site in August 2011 and has not been put into commission yet. The owner, Gazprom, initially planned to launch it in early 2012, but postponed the deadline till the 4th quarter of 2013. Greenpeace have staged a similar protest at the rig. The activists created a dangerous situation by climbing the oil rig, former Greenpeace leader Patrick Moore told RT. “Oil rigs are a very serious operation with big safety issues. You start scaling a rig, people come to try to get you off it, it puts them in danger and so I can certainly understand why they were apprehended and towed away from the site,” Moore said. Moore believes the activists knowingly and purposefully committed civil disobedience. “I do tend to agree with President Putin that they are not pirates, their intentions were not to loot the rig, but they were still putting people in danger,” he said.